We hear a lot about vehicles powered by fossil fuels and electricity. But fish as a power source? Not so much. However, that’s the direction one major cruise line is taking. It’s found a way to create a biogas out of the parts leftover after factories process fish for food — and by transitioning to this biogas, Norwegian cruise line Hurtigruten thinks it’ll be able to decrease its ships’ negative impact on the environment. When organic matter breaks down in the absence of oxygen, it produces a mix of gasses that together form a biogas. 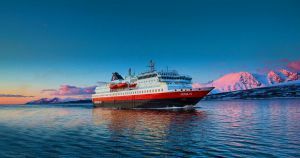 Hurtigruten plans to create its own biogas from a mix of fish leftovers and other organic waste. It will then liquify this gas and use the fuel to power its ships. By 2021, the company hopes to have at least six of its 17 ships converted to run on a combination of this biogas and large battery packs that will store energy generated by renewables. Hurtigruten isn’t the first transportation company to make the transition to greener fuel. But generating power from fish heads and guts? That’s a decidedly strange move — and one that Skjeldam sees as totally logical for his company.